This past Wednesday — Ash Wednesday — our pastoral staff stood at the local commuter train station with our Episcopalian counterparts offering an ashen cross on the forehead of commuters who were willing to take 30 seconds out of their busy day for a spiritual moment. We’ve done this now for 4 years and it always gets a lot of attention in the press. This year, my colleague appeared in a photo on the front page of our local daily newspaper. It’s good for the church to out in the world, right? I’m here to express a pretty strong tension and ambivalence about this practice. Four years ago, when we began the practice annual tradition, it was new and fresh; I’ve got the personality that is always eager to try something new, just to see if it will work or not. I had heard of the practice from St. Gregory Episcopalian parish in San Francisco, though I understand it was actually conceived by an Episcopalian parish in St. Louis. I talked to my colleague at St. Mark’s Episcopal Church; he also was aware of the practice and we agreed to make it a joint project. Here’s what we do. We stake out a little corner of the parking lot near the commuter train station that the majority of the commuters have to pass by on the way to their preferred train. 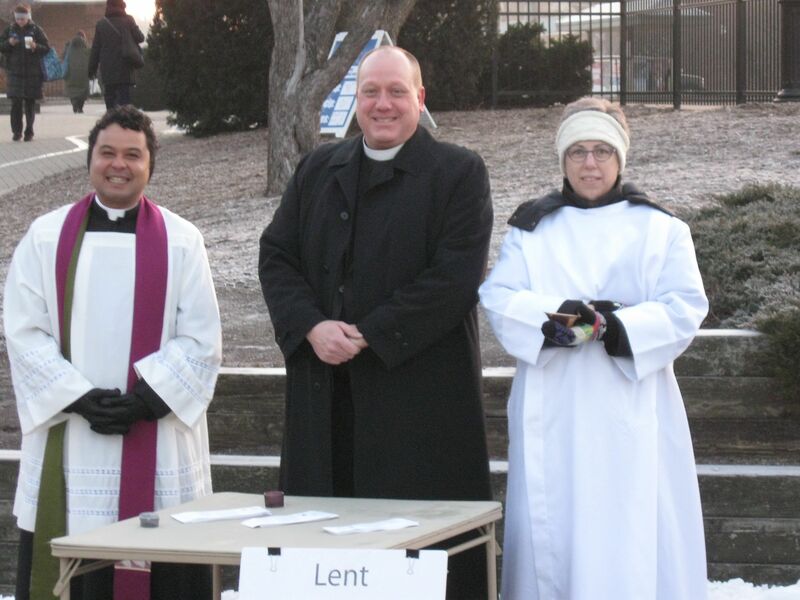 We have a little table, a cross, a sandwich board sign, and two or three clergy are positioned near the table. We seek to be upbeat and hospitable, greeting people as they pass by. Some ignore us, refusing to make eye contact. Some make eye contact, smile, say a warm “hello” and keep walking. Some actually stop and ask for the ashen cross. We ask their first name and then make an ashen cross speaking the words, “Roger, remember that you are dust; to dust you shall return.” Then we hand them a card with a one-paragraph explanation of Ash Wednesday, an Ash Wednesday prayer, and the service times of our parishes printed on the back side. On the one hand, it’s good for the church to get out in the world. Too often we do our thing inside our safe buildings and we expect people to come to us. Except they’re not coming to us. We are seen as irrelevant or worse. So, it’s good to take our message of our mortality, of the temporariness of life, of our brokenness and God’s work of healing and reconciliation to the street. It’s good to communicate that we care about more than our members, that we can be warm and hospitable, and that we don’t have to be judgmental. On the other hand, I wonder if we are not giving the wrong impression of the church. That our rituals are paper thin; that no commitment is required; that a little spirituality in the form of ashes on the head can’t do anyone any harm. See you next year, kind of thing. What I hope for people is that people will know God and know the peace of God’s grace and mercy, and that know the joy of being called to something bigger than themselves and that they, too, will become part of the big thing that God is doing to bring fullness to all creation. I’m just not sure that drive-by ashes at the train station brings them any closer to being a part of that big, wonderful, life-giving project. This entry was posted in Uncategorized on February 17, 2013 by Jim Honig. Why do you suppose this is only drive-by and superficial. They stopped..they received this mark and reminder, to them and those who see their cross all that day…a symbol that may bring thought and reflection you cannot know. This offering is not insignificant. When I first heard of this kind of thing happening, my immediate reaction was a negative one. It seemed to me to be nothing more than a “drive through communion” with pre-packaged wafer and wine, with little or no commitment to a local faith community–a kind of “Lone Ranger” approach to the faith (“me and Jesus”). As I have continued to reflect on “Ashes to Go,” I still have the feeling that the cross of ashes on the first day of Lent must have some ongoing connection with what happens between AW and the Great Three Days. And, I guess that means doing the ritual in the context of of a local assembly of believers. Otherwise, it seems to be a tivialized moment in time. As a commuter I can say that it warms my heart to see the pastors out on Ash Wednesday and serving the community in this small way. I’m a regular church goer, but for mid-week services it can be hard to get to church at a given time for a service…. knowing that I started my day receiving the sign of the cross can be so uplifting. I agree that it is not insignificant and thank you for participating.